A couple from California came to my 47th Ukulele Strumming Workshop on March 10, 2018 at the Bailey House. 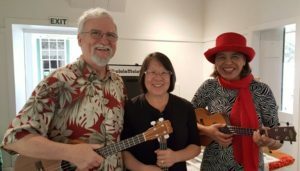 A couple from California came to my 47th ‘Ukulele Strumming Workshop on March 10, 2018 from 10 – 11 a.m. at the Bailey House in Wailuku. This brought the total to 646 participants since I began teaching these workshops at the museum on July 14, 2012. The couple just happened to be touring the museum the day before when they saw my Workshop poster. They were excited to meet me because they had watched my ‘ukulele lesson video on “Goodnight, Irene” on my YouTube channel. They play in a group and entertain at senior facilities in California. We had a private lesson for two since the other three people who had also pre-registered for the workshop did not show up. Goodnight, Irene – 3-chord song with 3 Waltz Strums. SUBSCRIBE TO ONLINE LESSONS for 30 days at-a-time access. Get the downloadable song sheets, video lesson, audio recording, and video story behind the song for each lesson. Basics Online – Goodnight, Irene and 7 more lessons for beginners. Beyond the Basics Online – Goodnight, Irene and 15 more lessons for intermediate players. For a listing of all Ukulele Mele products and services, click here.